One of the considerations for the RV life that doesn’t get discussed enough is how to adapt your pets to living that RV life with you. Dogs are fairly easy to adapt, but cats are an entirely different story. Check out these creative solutions for keeping your cat happy and tidy while you travel the open road together. Carrier Placement: Where Can Your Cat Ride in Safety? Keeping your litter box out in the open not only makes for a potential mess and odor control issues, but it’s also not convenient for your cat to “do their business”. Consider installing your litter box under seating, in dinette nooks, closets, under sinks, and other out-of-the-way locations that will easily fit a cat box. When planning out where to put that litter box, you also need a system for dealing with the litter that the cats will inevitably track into and out of the litter box. 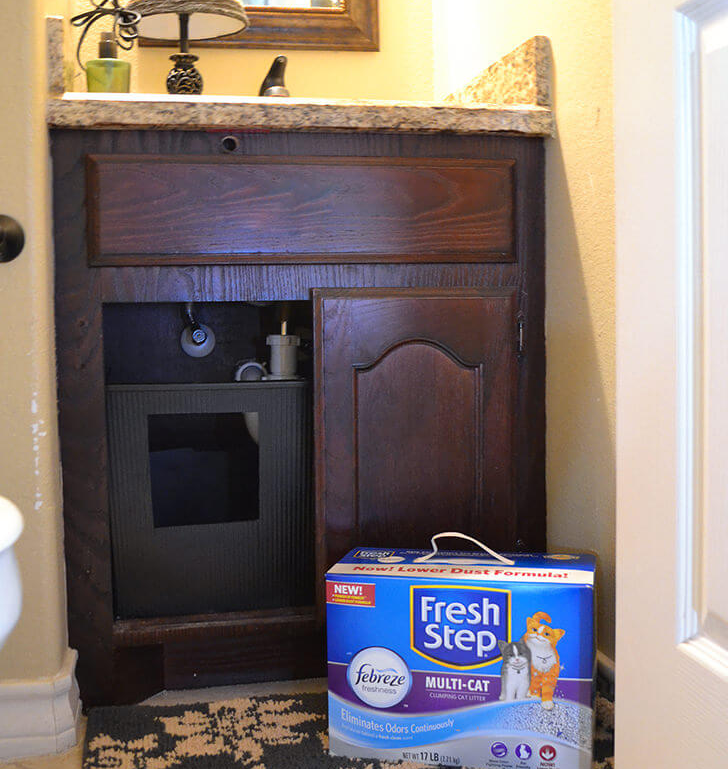 Putting a litter trap mat (which can be purchased at most supermarkets and big box retailers) under the cat flap or other opening you install to allow your cat access to the litter box goes a long way toward keeping litter in a centralized location. 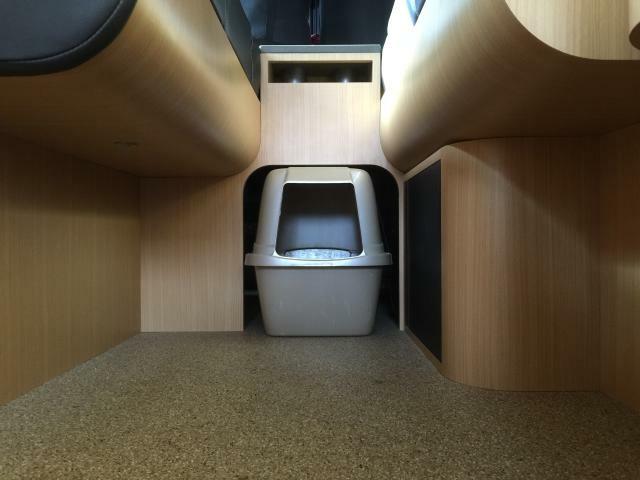 Keep in mind you don’t need to cut out multiple wall panels in your RV just to have convenient place for your litter box. Existing fixtures work just as well, like this example that makes use of an old battery storage compartment. Be sure to secure the litter box for when your vehicle is in motion, and a cat flap over the enclosure keeps everything neat and the odor from spreading. This is a particularly innovative concept for using the cabinet under a bathroom sink with easy access for cats. Everything stays neat and tidy, and the cats can easily come and go as they please. Got a cat that loves to cuddle? Install their litter box in the base of an end table in your sleeping area, and they can easily take care of business without needing you to get up to let them out of your room at night. 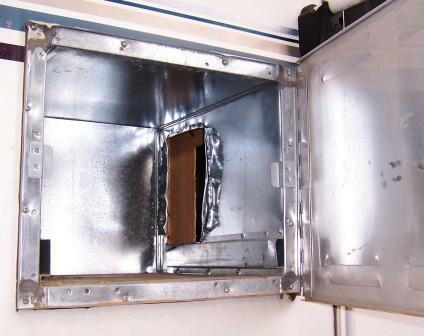 An easy litter box fix is to use existing storage spaces for litter box storage with little or no modification. This is particularly useful if your storage is easily accessible from the cab. Check out this unique solution for litter box storage in an existing space. Sometimes the ideal solution is to combine use of space for both litter boxes and cat sleeping/living spaces. Installing a miniature cat condo in your RV is a simple process, and often requires little permanent modification. Owners typically install sleeping spaces above the litter box or boxes, and cat condos typically only occupy about a half a closet space when installed properly. If you’ve got the space and the know-how, this is an excellent way for your cat to stay safe and still get some fresh air. It also provides an elegant solution to your litter box needs without ever having to clean or scoop the litter box inside your RV. These install easily in the slid out compartment of a 5th wheel or even big Class A rigs. 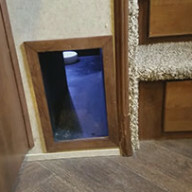 Converting an exterior access storage bay is an easy way to make litter box cleaning a tidy affair and help your cat stay safe and comfortable when you are on the road. Aside from an RV friendly litter box, your cat will also need to get used to RV travel. Installing a sliding automatic door rather than a swing door keeps your cat from escaping when you are parked, and a back seat cat tube is a great way to travel with them if you are pulling a 5th wheel or similar towable RV. Many RV cat owners also recommend a leash jacket of some kind so you can keep your cat safe outside when it’s time for some fresh air. 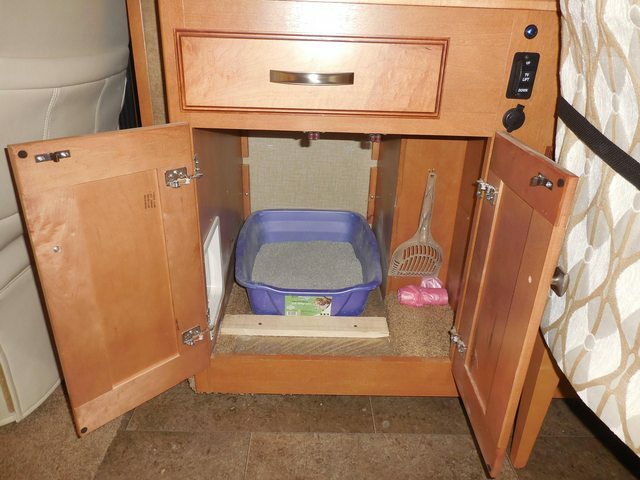 Love these innovative litter box and cat living space ideas for your RV? Let us know in the comments! Feel free to like and share as always.